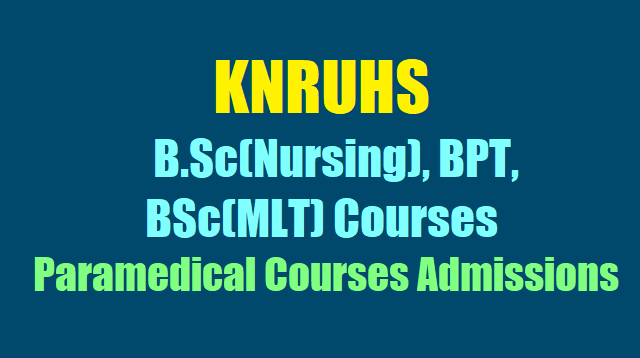 KNRUHS B.Sc(Nursing),BPT,B.Sc(MLT) Courses Admissions 2018, KNRUHS Paramedical Degree Courses Admissions 2018, Para Medical Online Application for 2018-18: KNRUHS admission notification for BPT, B.Sc., (MLT),B.Sc.,Nursing 4 YDC, Post basic Nursing 2 YDC Courses for the Academic year 2018-2019 in the State of TELANGANA Application forms for admission into the following courses for the academic year 2018-19 into affiliated colleges to KNR University of Health Sciences, Warangal in the state of Telangana is invited from the eligible candidates through online. Admission notifcation for admission into BPT, B.Sc., NURSING 4YDC COURSES & B.Sc., (MLT) P.B.BSc (N) 2YDC for 2018-18 in colleges affiliated to KNRUHS in the state of Telangana. Application forms are invited on-line for admission into the following courses for the academic year 2018-19 into affiliated colleges to KNR University of Health Sciences, Warangal in the state of Telangana from eligible candidates. The last date for on-line applications into B.P.T / BSc (NURSING ) 4YDC / P.B.BSc(NURSING) 2YDC / BSC (MLT) courses 2018-19 has been extended up to 6.00 P.M. on 05-09-2018. The provisional merit list will be displayed on KNR UHS web-site. Schedule for Verification of Original Certificates and Counseling will be notified later. Last Date For OnLine Applications: Last Date For OnLine Applications Of PARAMEDICAL COURSES 2018-18 B.P.T /BSc(NURSING) 4YDC / P.B.BSc(NURSING) 2YDC/ BSC(MLT): The last date for on-line applications into B.P.T / BSc (NURSING ) 4YDC / P.B.BSc(NURSING) 2YDC / BSC (MLT) courses 2018-19 is 05-0-2018. The provisional merit list will be displayed on KNR UHS web-site. Schedule for Verification of Original Certificates and Counseling will be notified later. MERIT LIST: KNRUHS B.Sc(Nursing), BPT, BSc(MLT),POST BASIC BSC(N) 2YDC Courses Merit List Results to be announced on Website. B.Sc(Nursing), BPT, BSc(MLT),POST BASIC BSC(N) 2YDC Courses Admissions Merit List after Certificates verification. The candidate has to apply separately for each course. 2. Bachelor of Science in Nursing i.e. B.Sc., (Nursing) 4 Years Degree Course. 4. Post Basic BSc (Nursing) 2YDC. Application forms are available separately for each course on-line on the web-site: http://tsparamed.tsche.in from 11.00 A.M. on 11-08-2018 to 05-09-2018 up to 5.00 P.M.
1. The Minimum age for admission shall be 17 years on 31st December on the year in which admission is sought. a) 10+2 Passed @ 45% aggregate of marks in science (Physics, Chemistry and Biology) and English is compulsory subject in 10+2. b) 10+2 passed out from recognized board under AISSCE/CBSE/ICSE/SSCE/HSCE/NIOS /TOSS or other equivalent Board with Physics, Chemistry and Biology. (Physics, Chemistry and Biology) as per the norms of Nursing Council of India. 3. Students shall be medically fit. 5. Candidates possessing basic qualification i.e. 10+2 from other than Board of Intermediate Education of AP /Telangana are required to submit equivalency certificate issued by Board of Intermediate Education, Telangana. 1. Candidates seeking admission into Post Basic B.Sc., (Nursing) Course should hav e passed Intermediate Examination. Any other equivalent examination (10+2 pattern) recognized by the University in Telangana or Board of Intermediate Education Telangana or NIOS, TSOSS – Indian Nursing Council Regulations. 2. Should have passed General Nursing and Midwifery from an institution recognized by the Govt. of Telangana or Nursing Council of India and shall be registered with the State Nursing Council. (Eligibility Criteria is as per G.O.Ms.No.269, HM & FW (K2) Dept., Dt. 30-11-2009 as amended in G.O.Ms.No.194, HM & FW (K2) Dept., Dt. 07-07-2011, G.O.Ms.No.40, HM & FW (K2) Dept., Dt.18-02-2012 and orders issued by Government of Telangana from time to time. Registration Fee/Application fee : Rs.2,000/- for OC/BC and Rs.1,600/- for SC/ST Candidates for each course separately. Merit List for all the above courses will be displayed on the web-site of the KNRUHS after verification of the Original Certificates. Candidates are directed to read the prospectus of each of the courses displayed on KNRUHS web-site i.e. www.knruhs.in carefully before filling the on-line application form and payment of application fee. In case of any new colleges are affiliated to the University for the year 2018-18 before the date of Counseling, the seats in those colleges will also be filled up. NO FURTHER NOTIFICATION WILL BE ISSUED.